Western blot analysis of HeLa cell extracts, untreated (-) or Caspase-3 knock-out (+), using Caspase-3 Antibody #9662 (upper), or β-actin (13E5) Rabbit mAb #4970 (lower). 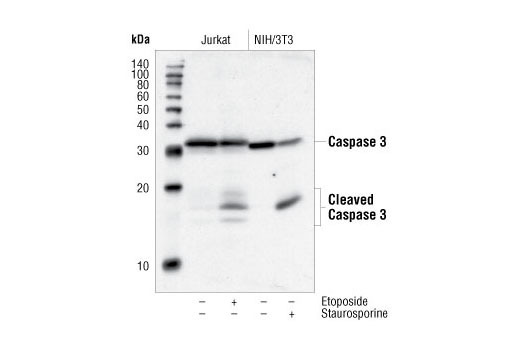 Western blot analysis of extracts from Jurkat cells, untreated or etoposide-treated (25uM, 5hrs), and NIH/3T3 cells, untreated or staurosporine-treated (1uM, 3hrs), using Caspase-3 Antibody. 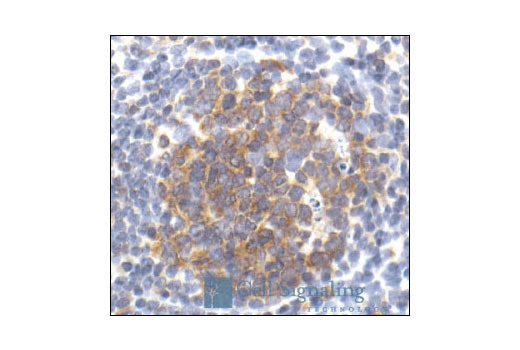 Immunohistochemical staining of paraffin-embedded human tonsil, showing cytoplasmic localization, using Caspase-3 Antibody. Remove blocking solution and add 100–400 µl primary antibody diluted in recommended antibody diluent to each section. Incubate overnight at 4°C. Caspase-3 Antibody detects endogenous levels of full length caspase-3 (35 kDa) and the large fragment of caspase-3 resulting from cleavage (17 kDa). Polyclonal antibodies are produced by immunizing animals with a synthetic peptide corresponding to residues surrounding the cleavage site of human caspase-3. Antibodies are purified by protein A and peptide affinity chromatography.